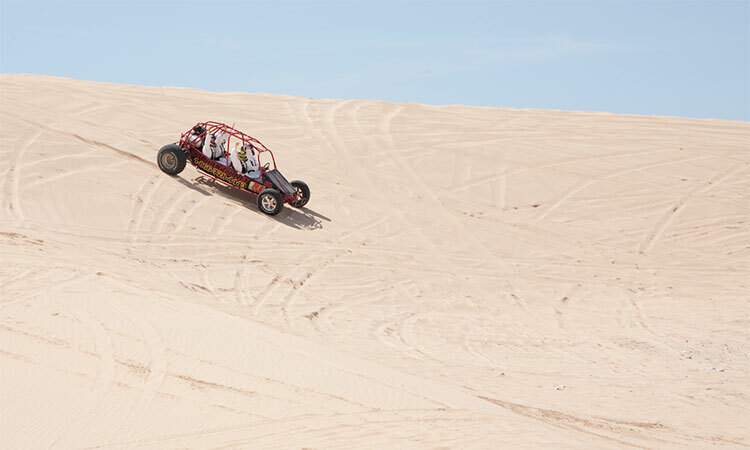 If you want a true adventure, it doesn’t get crazier than driving a dune buggy over desert terrain—it’s playing in the sand, for grown-ups. 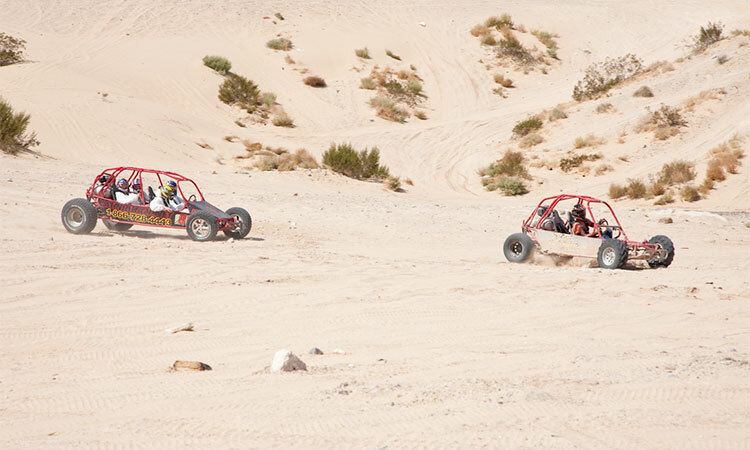 Go off-roading in your very own Vegas dune buggy through 15,000 acres of dunes, gravel, hard pack, hills, valleys, and washed-out creek beds. 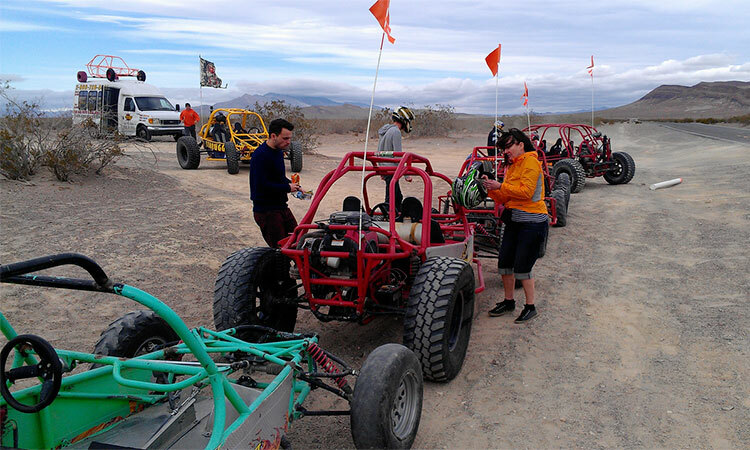 Whether you crave a solo excursion, want to put a new twist on a bachelor party, or are interested in corporate team building, our dune buggy rentals are guaranteed to deliver a memorable, thrilling experience. 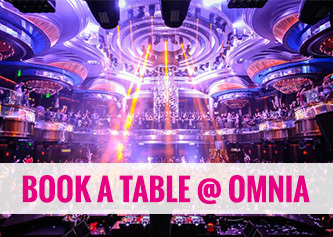 With complimentary round-trip shuttle pickup from your location of choice, and unlimited bottled water, you’re all set for the ride of your life. RUNNING 365 DAYS A YEAR! Free shuttle from anywhere in Las Vegas! By far our most popular adventure, this is 30 minutes of heart-pounding chase in the Vegas dunes. 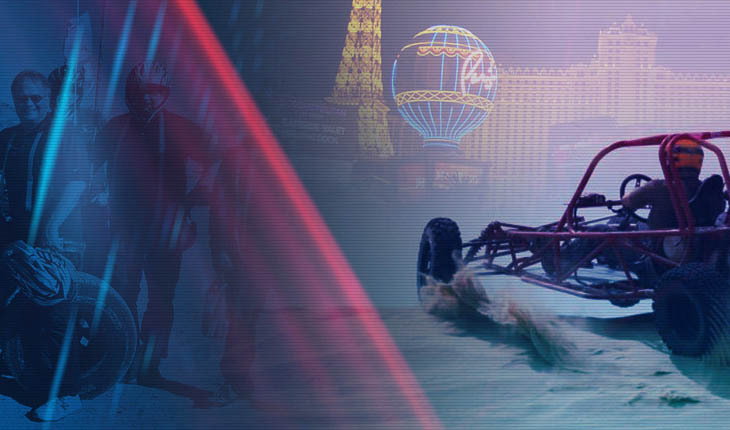 Rolling Stone magazine has called it “Sin City’s Best Near Death Experience,” and the tight, twisty trails will challenge your driving abilities as you chase one of our expert Dunies. A full-face helmet and 4-point harness keep you safe; go as fast as you’re comfortable. Our buggies have gas, brake, and steering just like an automatic car, so you don’t need any special training—just keep your eyes peeled for the Dunie, and head out into the wild. The Mini Baja Chase, tripled—90 minutes of tearing through the Vegas Dunes! This eXtended chase is intense, and lasts a long time. You’ve been warned! 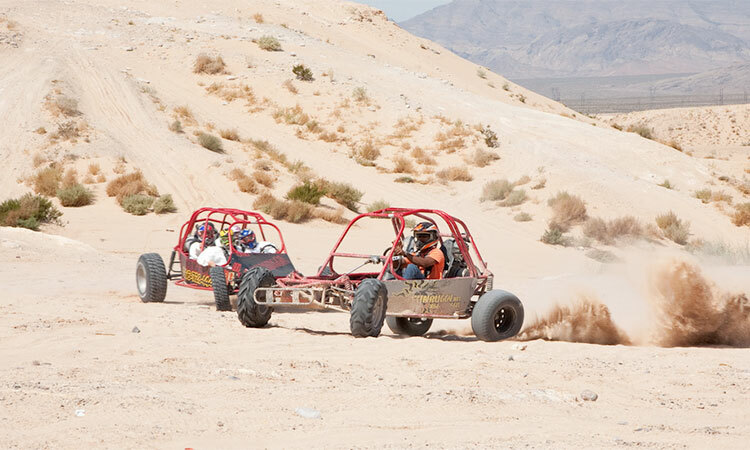 A more casual paced adventure, you can ride along with a guide or drive your own Sun Buggy Desert Racer through the Vegas Dunes Recreation Area. Overlook the Strip in the valley below, with a few friends or as a family; this tour is ideally suited to our larger buggies. Spend half an hour on the sand, and see what driving on the dunes is all about. If you want more time exploring the dunes, opt for the eXtended tour, which gives you 90 minutes out on the sand. Tour the breathtaking rock formations and red sand of the Valley of Fire, described as one of the top off-road riding areas in the country. Star Trek fans will recognize the bright red rock of many of the early sets. Due to the fragile nature of this desert ecosystem, speed is strictly limited and no access zones are enforced; in fact, we are the only approved dune buggy rental operation allowed in, and fully support the “tread lightly” mentality. If you want gorgeous pictures, the beauty of the Valley of Fire is unparalleled. Ride with a guide or drive yourself for this approximately 7-hour nature tour. Pickups at 7:00am, 9:30am, and Noon. For a full-day adventure like you’ve never known, visit the aptly named Amargosa, which means “big dune.” These dunes, located 2 hours from the Strip, are breathtaking in their immensity. Exceeding 500 feet in height, they are the tallest dunes in America, and the huge bowls between them are perfectly designed to race down one side and back up the other. We’ll show you how to drive the buggies and navigate the area, and then you’ll be off exploring on your own. Take our free shuttle to get to the site, or we can arrange a helicopter to whisk you up to Amargosa if you’d prefer speed. Lunch is included, since this is an all-day excursion. If you don’t want to leave, you can even arrange a 24-hour tour with a motor home, which we’ll pick up and provision with you. 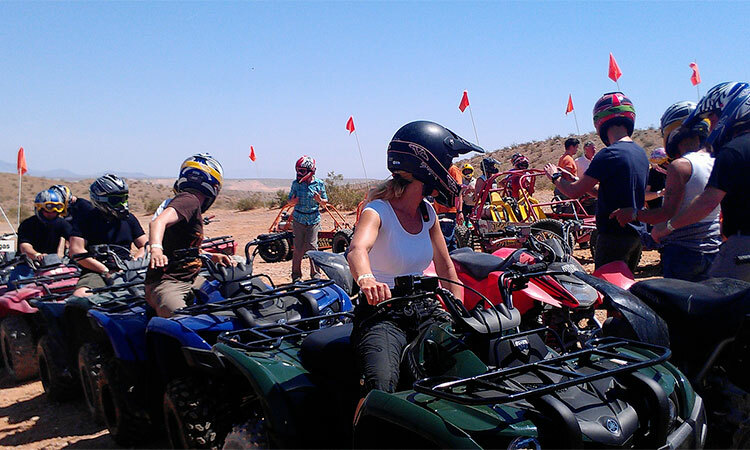 This two-part excursion includes nine hours of thrills across the sand and dunes around Vegas. 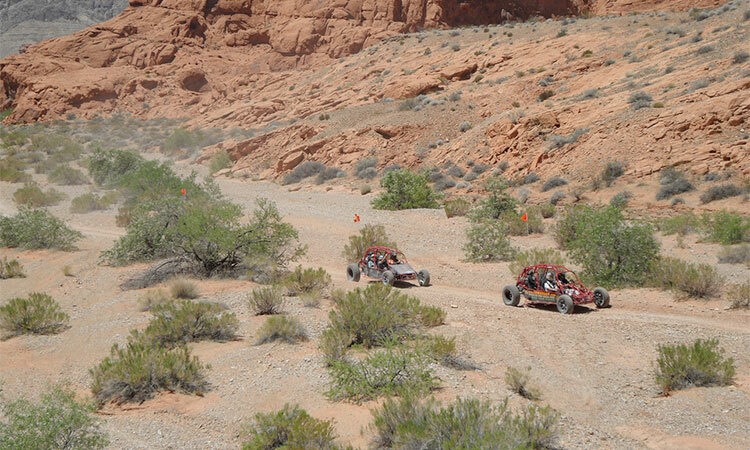 You’ll spend 2-½ hours on a Suzuki Eiger 4×4 ATV, taking in the Valley of Fire. The alien terrain was used to film the original Star Trek, and the red rock formations and sand cliffs are unlike anything you’ve ever seen. We provide lunch as we transport you to the Vegas Dunes, for a 2-hour Mini Baja Chase—half an hour longer than even our extended tour. Ricochet around dried river beds, sheer cliffs, and a place called rattlesnake rocks—the adventure will require all your strength and stamina, and we’ll even give you the T-shirt to prove you did it, before transporting you back to your resort. After your Buggy ride you’ll receive a complementary Sun Buggy Fun Rentals souvenir T-shirt and be shuttled back to your resort. 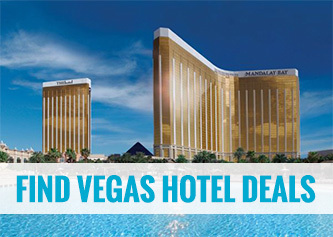 Pricing is all inclusive which provides for complimentary round trip transportation from your resort of choice anywhere in Las Vegas. The Shuttle drivers and Desert guides give their best to provide you excellent service and it is customary to tip. How much you tip is completely at your discretion and not a requirement, but a general guideline would be $10 to $20 per group for your shuttle driver and $20 to $30 per buggy for your desert guide. Dune Buggy Reservations are guaranteed, as such there are NO CANCELLATIONS. Should a customer need to change or delay their reservation and can provide a minimum of 24 hours notice, rescheduling or delaying to a later date is permissible for up to 2 years. Without 24 hour notice no rescheduling is permitted and there are no refunds for missing a reserved time. Clients are expected to follow safety instruction of their Dunie and failure to do so may result in early termination of their experience with remaining ride time forfeited. Safety is no accident! Any type of mechanical issues not the fault of the customer affecting rental time are fairly compensated with additional ride time.